First in the fabulous new Candy Holliday Murder mystery series. What could be more pleasant than a small town beauty pageant? In Cape Willington it’s not quite the happy event you would think. The Blueberry Queen Pageant is surrounded by scandal and murder. Candy Holliday runs the Blueberry Acres farm with her father. Her best friend’s daughter is a contestant in the pageant so she’s more than a little interested in the outcome. 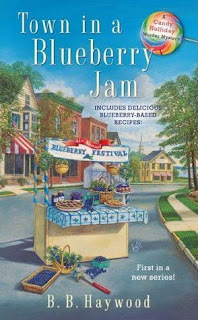 When the new Blueberry Queen is killed, Candy’s handyman is arrested. She knows Ray very well and there’s no way the man is a murderer. Candy is determined to find out who the real killer is. With the help of her best friend, Maggie, Candy defies the local police department and conducts her own investigation. Sometimes I felt as if they were Thelma and Louise or maybe Lucy and Ethel. Either way, Maggie and Candy make a great team. They had me at the edge-of-my-seat as they risked their lives for each other. Cape Willington is filled with a motley cast of characters. Most of them filled with their own secrets and gossip. All of it is, somehow, tied to the Blueberry Queen Pageant and their new Queen. The storyline is intriguing and kept me guessing to the end. Just when you think you’ve figured it out, you realize you haven’t. The well written storyline and characters make me want to visit this small town again in the near future. This series has been on my radar for a long time and I’m finally getting around to it now. I borrowed the e-book version from my library. Now I plan to catch up with the rest of the series. This is the first book and there are currently a total of eight in the series. I borrowed the e-book from my library. I was not required to write a positive review. All opinions expressed are my own. A Maine Village and a blueberry farm...sounds great! This sounds like another clever cozy. Terrific review, Yvonne! Enjoy your weekend. That is the tastiest title :) And a rather inviting cosy!